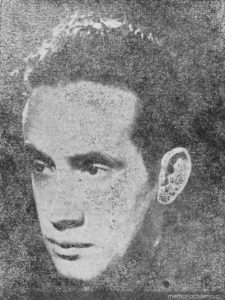 The surrealist poet, Carlos de Rokha was born in 1920 in the city of Valparaíso, Chile, the oldest son of poets Winett and Pablo de Rokha. There is some discrepancy about the exact date of his birth, like the date of publication when some of his poems first saw the light of day, however, which adds to the elusive quality of the biography of this unconventional and talented writer. A Wikipedia page dates his birth as August 17, while other sources have Santiago as the city, and not Valparaíso. The first well-researched edition of El orden visible, Vol. II (2011), documents the date as March 28. Still, a microfilm image of the Chilean Registry of Births, lists the date as July 28. Although it seems as though we know a great deal about the de Rokha family, the writers, the painters, and the great contribution of his father, Pablo de Rokha*, to the literary vanguards of early 20th century in the Southern Cone, there is a great deal more to be said. It is only recently, for instance, that critical studies have been undertaken in earnest, and more complete editions of the work of the elder de Rokha have become available. Regarding the poetry of Winett de Rokha, on the other hand, it needs to be rediscovered. For now, back to our poet. Had he lived beyond the early hours of September 29, 1962 he would have been 98 years old, a not inconceivable age to be alive these days. But Carlos de Rokha lived quite a difficult life, struggling with mental illness at a time when not enough was known about schizophrenia and depression, and in addition to the social stigma it carried, there was little hope of treatment. 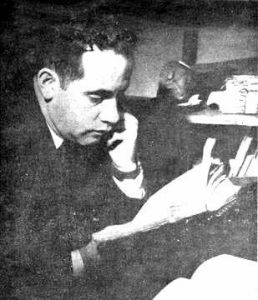 On the dawn of that Spring day in Santiago, it is possible that Carlos met his death due to an accidental overdose of medications and alcohol, or perhaps he went knowingly, as he often wrote, in the hundreds of poems that were left behind. Only two books were published during his lifetime, Canto profético al primer mundo (1944), and El orden visible, volume I (1956). 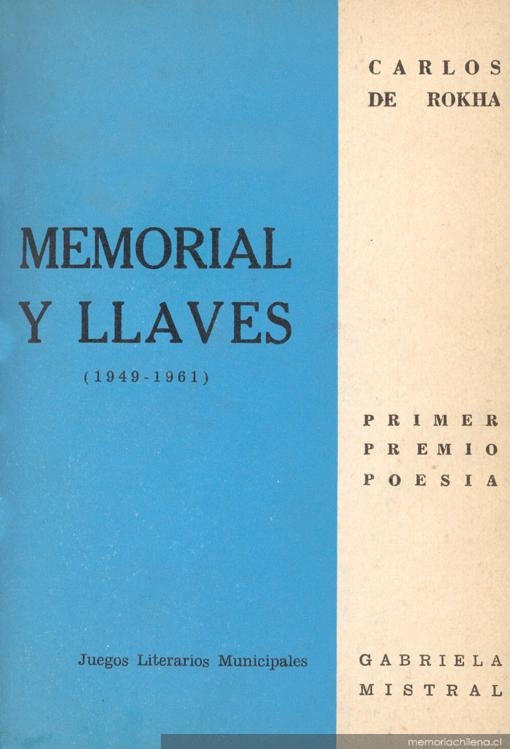 Two more poetry collections were released posthumously, Memorial y llaves in 1964, and Pavana del gallo y el arlequín, in 1967; but in a tattered suitcase he left manuscripts and detailed plans for two other volumes comprising the work of nearly two decades. The first of these, El orden visible, volume II, was finally published in 2011, and there are plans to publish the last volume in the coming years. The work of Carlos de Rokha is the subject of my doctoral dissertation, and I am also at work on a translation into English of selected poems that represent the various stages of his lyric. Although he was a poet whose work was hardly known outside a small circle, and little critical work had been done until the beginning of this century, he was regarded by many who read him to be a gifted poet who pledged to live his life as the embodiment of poetry; autodidactic and eccentric, a kind, generous friend, almost childlike in his demeanor, of fluid gender, at times succumbing to fantastic visions, he was one of the most interesting figures of the Chilean literary tradition. His early work of unmistakeable and fecund imagery was shaped by the literary currents of the vanguards, particularly by the late surrealism of Latin America in the late 30s, but he searched beyond the dazzling images to a metaphysical, even cosmic, lyrical essence. Doubtless, his work is extremely difficult to translate, yet impossible to put aside. This post may experience many revisions before this first bilingual edition comes out. Often remembered as one of the poetas malditos of the generación del ’38, in Chile, de Rokha was indeed a friend and comrade of the members of the surrealist group, la Mandrágora, and considered to be one of the younger poets of that generation. 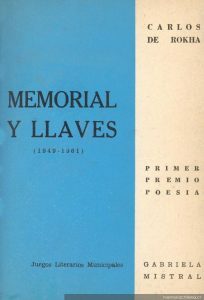 However, the greater part of his work was completed in the next two decades, and, with the publication of the second volume of El orden visible, we now know that this was a poet who reached his maturity in the late 1950s. From this point to his death in September of 1962, his work experienced a transition to greater lyrical refinement within a more somber, interior landscape. A blend of all these elements can be appreciated in the poems below (my translations in progress), which date from the later period of his work, found in the posthumous collections. my life to the great sea of origins? that blinds in pure echoes. Oh, echo of limits, sustain me! Choirs of angels, watch over me! at the height of the night of lamps. or a space in the wind among the ferns. I shall return, doves of the glass. diamond roosters, seagulls of the rain. Oh, sea, oh darkened time of my blood! of impatient breezes. Oh, time! what windy solitude bloomed between your fingers. solitude has gathered in my bones! But, who summons the ones who are absent? Open the doors of the tombs! a layer of frost coating the wire of the fences. 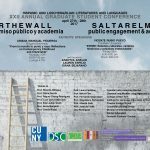 #CongresoHLBLL #overthewall #saltarelmuro abstracts Achy Obejas Ariana Mangual Figueroa Call for papers Carlos de Rokha CFP Hispanic Literatures and Languages congreso de estudiantes CUNY CUNY Grad Center disertación doctorado El orden visible Glotopolítica Graduate Center HLBLL HLBLL CUNY LAILAC Latin America and Asia Latin American women writers Lina Meruane Lingüística literatura en español Literatura y Latino Cultures Lydia Otero mental illness Moises Park over the wall Pavana del gallo y el arlequín poetry revolution & revolt conference saltar el muro Silvia Cho Surrealismo Sylvia Molloy Valeria Luiselli Vanguardia Chilena War XXII Congreso de estudiantes ¡Ingobernables!